Parla l'Italiano Magicamente! Speak Italian Magically! : Relax! You Can Learn Italian Now! What if you could Speak Italian Magically? If you are reading this, it means that YOU really want to speak Italian. Imagine YOU being already able to speak Italian and fluently, how would you feel? Excited, happy? Yes, of course! What if you could have fun and enjoy the learning process too? Wouldn't it be great? With Speak Italian Magically YOU will: * Travel to Italy and visit some of the most beautiful Italian cities! * Relax while learning new words and every day Italian Italian expressions! * Have fun with ten magic adventures into Italy and Italian, where the main carachter is YOU! * Begin to think in Italian! * Refresh Italian you might have learned previously! 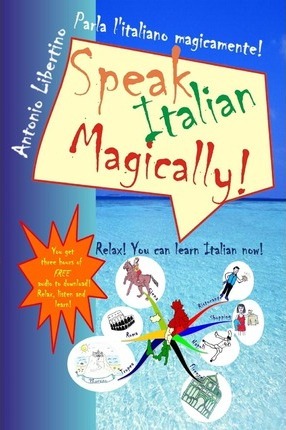 Speak Italian Magically features: * Accelerated learning methods to help you absorb the language faster * No memorization exercises * You can download 20 audio files for free to listen to each Italian adventure twice, bilingual and solo italiano version "I begin from the book cover. It really grabs you as a book is, winning, merry and also it has a flair graphic.You can really learn Italian magically and the secret is with the advice of the author when he says: 'Please remember to avoid listening to the audio-files while driving as they lead you in a state of relaxed alertness that speeds up the learning process'. At the beginning of every lesson infact the key word is 'relax' and there is a ritual for which one prepares himself to learn positively, without haste, without stress but naturally. Every lesson is a real situation. In my opinion we can use this method, which is the result of a thorough study by the author, with other languages too. Perhaps I will use it with my pupils. Congratulation Antonio, you made your best to implement your plans and carry them through out, good luck. Stay always like you are now.I loved it." Anna Romano Language Teacher in Italy A Q & A with the author Tell us about Speak Italian Magically in your own words. What is it about? The title says it all, doesn't it? It's a book for you to Speak Italian Magically! I know you may think that this is far fetched, but let me ask you something. Do you know that atlethes practice mental training before a performance? Do you know that they get better results when they imagine themself performing at their peak? Well, with Speak Italian Magically I wanted to give you a mental training where you will first imagine yourself both in the situation and the place speaking Italian very well...Then if you follow the guidelines, you will be actually speaking very well! Is there actually a science behind this approach? Yes, as I explain it thoroughly in the paragraph that you will find in the book. Do you know what the title of this paragraph is? The science behind Speak Italian Magically. Here you will find more about Lozanov and his suggestopedia, accelerated learning, Vera F. Birkenbihl, Stephen Krashen, James Asher and Tony Buzan's mind maps. What inspired you to write this book? 8 years ago when I started teaching Italian to foreigners I had a question. It was this: Is there a faster way to learn a language? Speak Italian Magically is my answer to that question. What's the best thing in this book? Speak Italian Magically will bring you in the wonderful places that we have here in Italy. So, At the same time you will experience Italian and living in a different country, all within your mind because I will guide you in a relaxed state where the learning is much improved. And I also recorded the audio in two versions, bilingual and only Italian version. Because I really think that once you understand the text you should practice with the only Italian version. Where can an Italian enthusiasth learn more about you and the book? Of course on the book website (www.speakitalianmagically.com) where you will find news, bonuses and tips to Speak Italian Magically! Imagine how you will feel by speaking another language, a different one than yours. Sense all the feelings you can feel. You will listen to yourself uttering different and pleasant sounds. You will see people astounded around you because of this new skill of yours. Will you be excited? Happy? Of course you will be! I will be excited for you too, because for me it is so rewarding to see people, who couldn't speak a word before, conversing in my own language. That is the real joy for me and I mean it from the heart. I am Antonio Libertino, born and living in Tropea, Italy and I share with you a passion for foreign languages and world cultures. It all begun when I realised that I couldn't communicate with a foreign girl I fell in love with, if I didn't know at least English. What did I do? I took the first cassette course I could find and started learning as fast as I could. I was really motivated to do that. What am I suggesting? That you should get an Italian boyfriend or girlfriend? That wouldn't be a bad idea too, but there are a lot of other ways to learn my language. And I can reveal them to you at your place. I went on, I learned how to speak English. That love story was over, but it started my passion for foreign languages and cultures. Then the director of an Italian school for foreigners asked me to teach Italian in his school. I asked: "How am I going to do that?." "I'll give you the book," he said. I soon realised it wasn't with just a book that I could teach people... I wanted to teach people and to let them feel at ease. During the years, I went on teaching in that school, untill I decided to work on my own. The teaching passion brought me to obtain the Ditals certificate Level II which is issued by the University of Siena for Foreigners, and it tests theoretical and practical knowledge of candidates in the fields of teaching Italian to foreigners. Sometimes it seems that an invisible force guides you to develop your passions and discover tricks and secrets to learn and teach a language. We can't deny we are living a learning revolution and especially in learning languages: we can't use anymore the teaching methods we used ten years ago. Today we have multimedia computers, internet, cd-roms, skype and learning a new language is so easy! Are you ready to speak my language? Knowledge is power and can also be fun if you know how to learn.